There’s a problem with Londinium, the Latin name for London. How should it be pronounced? I had always assumed the first i was short, and was happily toying with the idea of ending a Sapphic stanza with the word ‘Londinienses’ (the metre would require that i to be short) – when I read a comment by Bijan Omrani, classics teacher at Westminster School and versifier: ‘Unfortunately Londiniensis doesn’t scan in sapphics’. I consulted my Latin dictionary of choice, Lewis and Short, and it corroborated Bijan’s view (indeed, he probably got it from there). They mark that i long – Londīnium. But how did they know that, I wondered? The only references they give are to Latin prose writers (Tacitus, Pliny), who give no indication of the quantities. It didn’t make sense that a name which ended up with a barely vocalised final syllable – Lund’n - should once have had a long one in that place. If it had, it would surely have mutated into something like Londine (pronounced Lundeen). I decided that I would keep a short i in the Greek form of the word (which is found in Ptolemy) when I composed my Olympic ode in alcaic stanzas. The scansion of Londinium is interesting. Lewis and Short have the first i as long in Tacitus. I wrote an asclepiadic (Latin) Olympic poem with a shortened i, on the grounds that I am a Londoner and should be given some freedom in the scansion of the name of my own city. It also reflects the pronunciation better. You, using Greek, have even more licence. My own Latin Olympic poem, written for my own amusement, was in asclepiads like Horace Odes 1.1 ‘Maecenas atavis edite regibus’... there are probably lots of howlers, but few metrical slips I hope. quae sic mater eras tu quoque nobilis. certant et uiridem carpere gloriam! tu ludique boni, Londinium, tui. I wrote back, wondering if Lewis and Short simply make that i long by analogy with Lavinium and Corfinium. In both these cases, we know the first i is long because the names occur in verse (in Virgil and Lucan). It's not clear that we could know for certain what the correct quantity of the only other Roman towns with that ending that I can find should be – Aeminium, Bilachinium, and Corinium. The only thing left was to ‘phone a friend’. I dropped a note to the world expert Oxford philologist John Penney, feedback on whose riveting lectures once included the phrase ‘Penney’s from heaven’. I cannot imagine why L & S mark the i as long, and I don't in any case believe that they would be right to do so. There is, as far as I can see from all the attestations listed in Holder and Rivet & Smith, nothing to suggest that the vowel is long. In principle one should be able to tell from the form in which the name is borrowed into Old English, but OE Lunden in fact points to earlier *Lu:ndonion (: is a mark for vowel length), which is probably from *Lo:ndonion, with a treatment of the *o: that is variously ascribed to Vulgar Latin or to native British speech habits. Some would account for the Londinium form as arising by dissimilation from the vowel of the first syllable (o...o > o...i), others as arising by attraction to the vowel of the third syllable; but others suppose that these are just different suffixes. Nothing in all this supports a long i, and indeed having short vowels everywhere would facilitate the assimilation/dissimilation process, if that is what is going on. But a long vowel in the first syllable is a different matter, as one needs this to explain the spelling variations in the sources and the OE form: do you suppose that this is where the macron is supposed to be in L & S? I don't think you need change anything in your splendid ode: Londinion is a perfectly good Greek spelling (Ptolemy), and there is, as far as I can see, no evidence for a long i. Most philological queries, alas, seem to involve taking the lid off a can of worms. What a relief to have an expert pronounce so clearly on the matter! If the spirit takes me, I shall now happily embark on Latin Sapphics with ‘Londinienses’ in my mind for the coda of a stanza. The fact is that I have been storing up for use at the appropriate moment another Sapphic coda: the Virgilian phrase ‘primus ab oris’ . This was once artfully misread as ‘primus, a, Boris’ – ah, Boris first! But that’s another story. For Armand D'Angour's own Pindaric ode on the London Olympics (original Greek and English translation) see http://www.armand-dangour.com/pindaric-odes/, which also gives a translation of Kwasi Kwarteng's Latin verse. Kwarteng is best known as the author of Ghosts of Empire: Britain's Legacies in the Modern World. 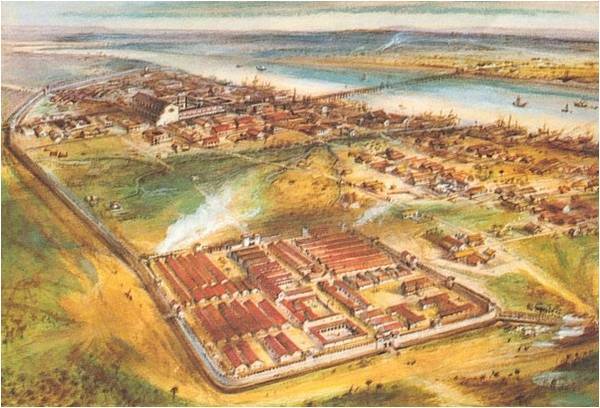 Before both settlements were destroyed in Boudicca's revolt (60 A.D.) the relative status of London and Colchester (Camulodunum), the former capital of the Trinovantes and the site of a temple to the Emperor Claudius, is uncertain However, some archaeologists have claimed that Colchester was the capital of the province up to that year and that the decision to make London the administrative centre came after the revolt was suppressed. 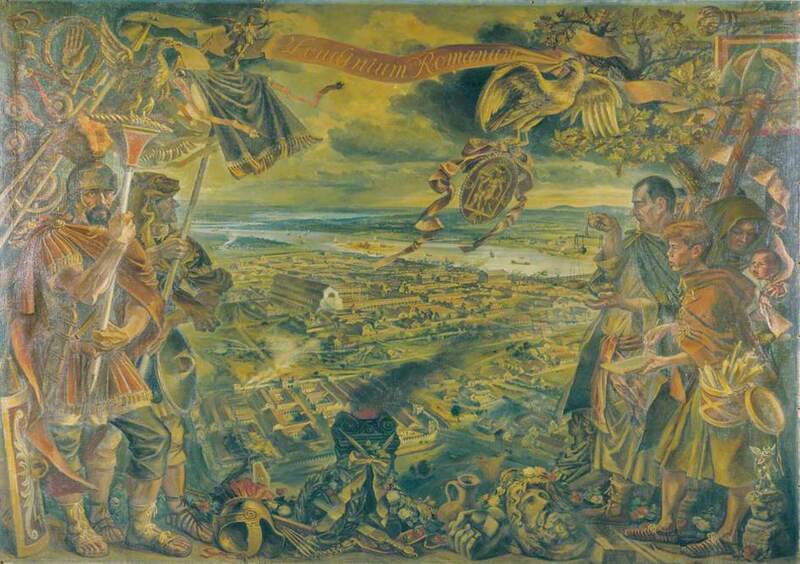 Alan Sorrell's `Londinium Romanum', a painting on display in London's Guildhall Gallery.